Hey, hey, what do you know? 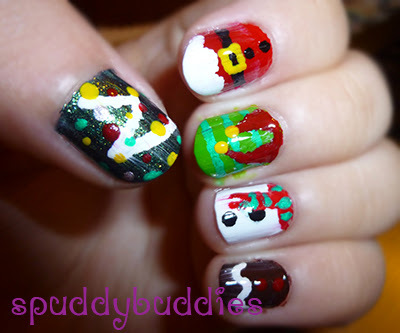 5 more days till Christmas and I've got the perfect holiday nail art to show you. 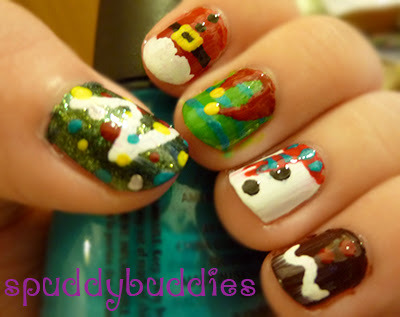 Today's nail art is a recreation of the Christmas nails that IHaveACupcake did. Here's the link to her video. I did these nails last year and I really wanted to do them again this year just to see if there's any improvement. Please excuse the bad angling of my hand, the poor lighting and smearing of polish (yeah, I had a horrible top coat that really didn't do much). As you can see, I used 7 colors but I can't remember exactly which polishes I used. I do know that I used China Glaze - Turned Up Turquoise, The Face Shop - BR602 (brown), a black nail art pen and a white nail art pen. I did this design using the tips and ends of skewer sticks only. Not too shabby, if I may say so myself. How hard was it to complete a design using only skewers? Not too difficult.. just that it requires a lot of patience. I believe I once said that nail art has helped increase my patience level. It's true, haha. I used to devote a lot of time and hard work - still do but less since I have a couple of proper tools these days. Don't give up on your nail art no matter what level you're at. You can do this and learn to embrace the imperfections of your nail art. I would say it's worth it. Don't forget to take breaks in between though. I think it's important to let your nails breathe and grow out once in a while. I hope you like my recreation of this nail art. Tell me which design is your favorite and if you've ever done Christmas nail art recreations by other nail art bloggers. 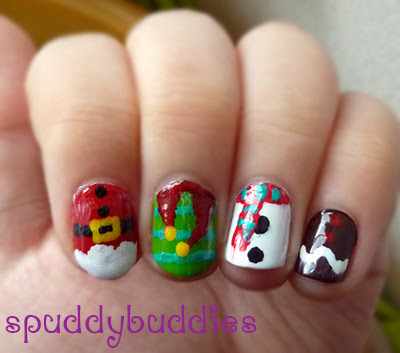 The Santa and the snowman nails are my favorites :) What a fun, festive mani!